The house is shaking. Your mind is racing. It sounds like a tornado touched down on your roof. What just happened? As you struggle not to go into sensory overload, you realize a tree has fallen on your home. Every year Vancouver and Portland are buffeted by storms. Wind and water bring down hundreds of the region’s trees during the couriise of the year. These normally gentle giants can shatter windows and rip through roofs and walls. 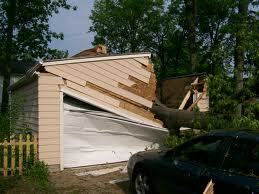 If your garage door is damaged during a storm, it’s important to secure your home as soon as possible. Ponderosa can help you with quick, competent garage door repair or replacement. If you’re in the middle of a crises, however, what should you do? Wind gusts as low as 30 miles per hour uproot trees. Even a tree that’s healthy can fall during a strong storm. If a tree falls on your home, the first priority is the safety of you and your family. Here’s what to do immediately after a tree goes down. Find family members and pets. Make sure everyone is OK. Move to a safe place. Go to a neighbor’s house if possible. If you have any doubt about the structural integrity of your house, don’t go back in until it’s been inspected for safety. Don’t touch downed wires. If electrical wires are down, stay well away. Don’t touch the tree. Live wires could be hidden in the debris. Call the power company and the police. The electric company may need to turn off power, especially if your home has been damaged by flooding. Don’t attempt to turn off the electricity yourself during flood conditions. Before returning to your home, a licensed electrician should check out your electricals. Contact your insurance company. Homeowner’s insurance usually pays to fix tree-caused damage to homes and insured structures such as detached garages and fences. Many insurance policies will also pay for tree removal if the tree falls on an insured structure. It doesn’t matter whether you own the tree, or it belongs to a neighbor. The key factor is whether the tree damages an insured structure. Take photos. Stay at a safe distance and take photos if possible. It could be some time before officials are able to investigate. Document the damage if you can. Don’t take risks to take photos, however. If the storm is active, wait for it to pass before venturing out. Secure your home. Your insurance company can help you find trustworthy contractors to temporarily secure your property. Agencies often have lists of prescreened contractors. Your roof may need a tarp. Windows and doors, including your garage door, may need to be boarded up. It could be days or weeks before permanent repairs are completed, but temporary fixes can start almost immediately. Call a tree service. Don’t attempt to remove a fallen tree yourself. It’s a dangerous job, and chances are good that your insurance will cover the removal. Your insurance agent may be able to recommend an arborist. Prevention is preferable to repair. If your home was on the wrong side of a fallen tree, the last thing you need is another tree coming down on your newly repaired roof or garage door. Another storm may be on the horizon. How can you protect your home from more damage? Inspect the trees around your property. Call an arborist to check a tree that looks sick or hazardous. Have overhanging, dead or diseased branches removed. Remove hazardous trees. If a tree is sick or damaged it’s more likely to fall during a storm. Insurance may exclude damages caused by trees that are deemed hazardous. In other words, if you own a tree that’s ready to topple, you might be liable for damages if it falls. Work with neighbors. Sometimes a neighbor’s hazardous tree poses a threat to your property. Work with your neighbor. You may be able to split the expense of removing overhanging branches or removal. If your garage has been damaged, it’s important to secure your home with prompt garage door repair. An open garage is an invitation to trouble, whether it’s from thieves, wildlife or another wave of inclement weather. Ponderosa Garage Doors can repair storm-damaged garage doors. If your door needs to be replaced, we’ll recommend the best option for your home and budget. We have a selection of doors that are both stylish and strong. Call us today for an estimate.